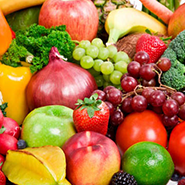 The Fresh Fruit and Vegetable Program (FFVP) is a federally assisted grant program providing free fresh fruits and vegetables during the school day to students participating in eligible schools. To be eligible for the program, the school must have a free and reduced rate of at least 50%; they must be an elementary school (grades PreK through 6th); they must agree to serve the fresh fruits or vegetables outside of any other child nutrition program (School Lunch, Breakfast, or Afterschool Snack Program); and they must complete an annual application. The goal of the FFVP is to improve children’s overall diet and create healthier eating habits to impact their present and future health. FFVP 2019-2020 Application Now Available! For additional information regarding FFVP, please contact Allie Caito-Sipe at acaito@doe.in.gov.